Palm Sunday Service: Sunday, April 14, at 9:30 a.m., at the church. All are welcome. Good Friday Service: Friday, April 19, at 9:30 a.m., at the church. All are welcome. Easter Sunday Sunrise Service: Sunday, April 21, at 7 a.m., at Lions Park. All are welcome. Easter Service: Sunday, April 21, at 9:30 a.m., at the church. Before the service, at 8:45 a.m., a light breakfast of muffins, cheese, fruit, juice, coffee and tea will be served. Communion will be observed during the service followed by more refreshments and fellowship. We will also bid a fond farewell to Robin Cunningham for sharing her musical talents with us. 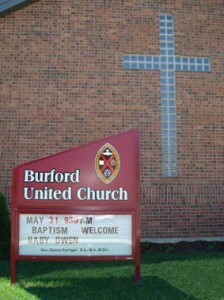 In the middle of luxuriant farm country, Burford United Church meets to celebrate God’s abundant love in word, sacrament, and song. The church places a high priority on outreach, with its pastoral-care team, active UCW, Sunday School and charitable fund-raising events.